If you are interested in getting wrought iron balcony railings in Toronto, OLG Railing Company should be the first business that comes to mind for you. 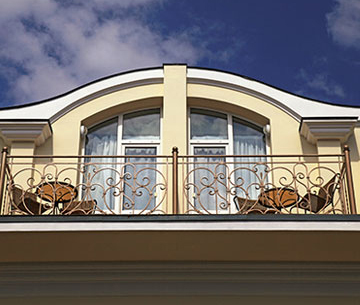 We specialise in the manufacture of wrought iron balconies. We also specialise in iron balcony railing galvanization. if you want to protect your iron balcony railings from unsightly rust, our galvanization service is the way to go. Our company also proudly accommodates residents of Vaughan. If you need assistance with wrought iron balcony railings in Vaughan, we are the seasoned and driven professionals you need to contact. If you are considering getting wrought iron balcony railings in Vaughan, we can dazzle you with our craftsmanship and diligent work. Our wrought iron balcony railings in Vaughan are sturdy, dependable and attractive. Our design selection is also diverse and extensive. We are not only about iron balcony railing manufacture and galvanization here at OLG Railing Company. We are also happy to say that we offer iron balcony railing installation service. Our professionals can even get rid of existing iron balcony railings for our customers who wish to remove them. Needless to say, we do it all. If you are looking for affordable prices on attractive and durable iron balcony railings in Toronto or Vaughan, call our company today to get additional information and to get started working with us. We are 100 percent devoted to providing our customers with amazing customer service every single day of the year. When it comes to craftsmanship, dedication and pure attention to detail, we have no competition. to introduce you to the variety of options that could drastically improve your home!